Appearance: Dog woman, long floppy ears, and brown and cream colored markngs. She has medium-long hair which can be pinned up or left down. Clothes: Rei always wears white dresses, but in the winter, or in mourning, tends to switch to a black or brown variant. She accessorizes with belts to unconventionally carry her weapons and pouches. She always wears a Feralys symbol necklace, and a gold earring in one ear. Strengths: Sword fighting, and impulse fight-or-flight decision making. Weaknesses: Alcoholic, rash decision-making, and long-distance shots. 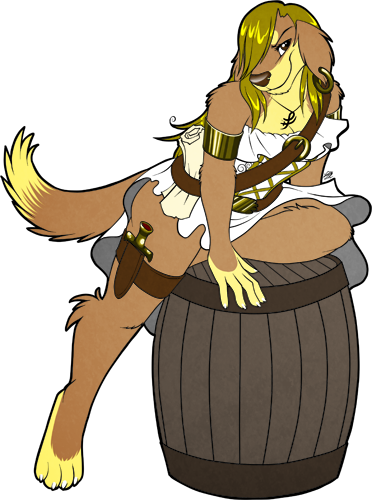 Weapons: She keeps with her a golden cutlass/ pistol (gunblade), an ivory flintlock, and a dagger. Reimina Clover Keishana was the firstborn daughter of King Montego Keishana, of Amethyst Valley in Tischna. Her parents disappeared while she was young, during a castle invasion by black dragons, known as The Oxinians. Amethyst Valley was later taken over by a new ruler: an albino leopard named Gendime Avrexi, someone of no relation to Rei, who also suspiciously allowed The Onixians to comfortably inhabit the outskirts of Amethyst Valley. After accidentally boarding the pirate ship Rustic, Rei grew up as a pirate and fell in love with a wolf named Erike. Because of him, she lost desire to return to royalty. Unfortunately, her ship was ambushed, and most of the crew were executed, including Erike. Rei grew up quiet and bitter, mercilessly stealing and killing just to survive. She swore to kill Avrexi, so with the help of a few old mercenary friends, she managed to personally take the king’s life in his sleep. Naturally, she hoped to reclaim her throne, but rumors that the Keishana family died off a long time ago denied the fact that it was her throne, so she was to be captured and to be charged for murder, in which she escaped. The Amethyst Valley kingdom was overshadowed by the High King of Shoalrije, and Reimina Keishana was forbidden to return (and would be killed in attempting to do so). Rei changed her appearance and hair color to become generally unrecognizable from any possible search for her. She soon partnered up with Tora Himitsu and Tsune Murasame to capture their first ship, the HMS Dosnmatta. Rei was appointed as an officer of the Dosnmatta, before the new captain mysteriously disappeared. Rei quickly stepped up and took charge in his absence. Rei is often recognized as Tischna’s Exotic Exile. Despite her petite appearance and amorous behavior, she often loses her temper, which tends to cause those around her to fear her wrath. She’s not one to socialize very much with others, unless to her interest. Her exceptions are Eddy and Rubian, who she depends on the most. Rei tends to use lust as a deception when she’s out to assassinate someone, specifically men with power. Plagued by the Night Death disease, she is burdened with the constant coughing of blood, and her desperation to pursue the antidote puts a strain on her relationship with her officers and crew.